This Light Award is sponsored by The Free Manifesting Meditation, and processed through Kiva.org. Marcela is 40 years old and she is originally from the indigenous community of otomí, a place full of vegetation where being a seamstress or a lamb farmer are the primary types of employment. She is a member of a group called "A New Glow" and the majority of the members sew crafts to sell. Marcela is associated with other women who make cakes, cookies, puddings, cheesecake and different desserts to sell. She says that she has worked with this business for approximately 4 years and she said that the sales are going well now that they take orders for special events and the cakes are homemade which the customers greatly prefer. In her free time she also makes textiles including napkins, pillows and tablecloths to sell. She says that in the place where they make the desserts she can also sell her textiles and that she achieves good sales. She is seeking a loan to improve her businesses and to buy materials and supplies for her sewing and her desserts like checkered cloth, fabrics, threads, needles, yarns and rings and for the desserts, chocolate mousse, different types of milk, flour, eggs, flavorings, and fruit, etc. She says that if she receives the loan her business will improve and she will be able to obtain earnings to support her children in school and to assist her husband with the expenses of their home. The other three members of the group are named Feliciana, Arnulfa and Pilar. 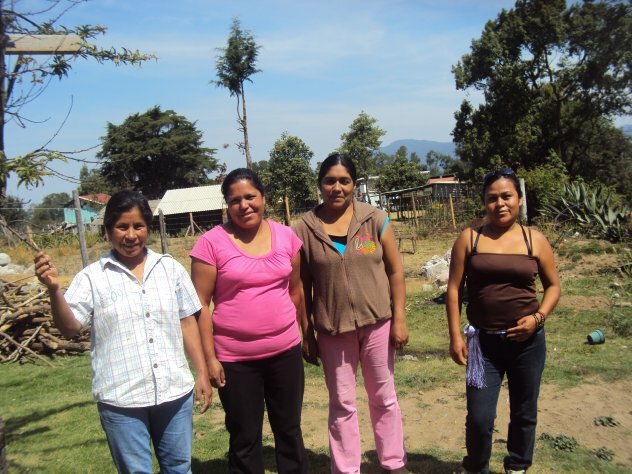 They will invest in their businesses through the purchase of fertilizers, nutrients for growing avocados, and corn seeds to sell and the purchase of materials for handmade embroidery. Congratulations to Un Nuevo Resplandor Group..!